The approximation of high-order plant and controller models by models of lower-order is an integral part of control system design and analysis. Until relatively recently model reduction was often based on physical intuition. For example, chemical engineers often assume that mixing is instantaneous and that packed distillation columns may be modelled using discrete trays. Electrical engineers represent transmission lines and the eddy currents in the rotor cage of induction motors by lumped circuits. Mechanical engineers remove high-frequency vibration modes from models of aircraft wings, turbine shafts and flexible structures. It may also be possible to replace high-order controllers by low-order approximations with little sacrifice in performance. 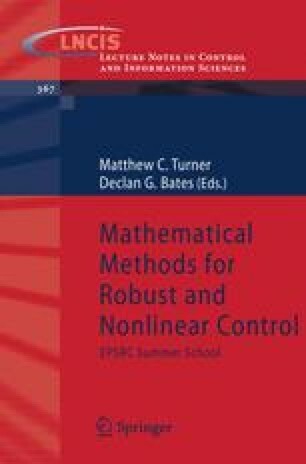 This chapter is based on Chapter 9 of “Linear Robust Control” . This book, together with the solutions manual, can be obtained from the authors in .pdf form on request.